Werner's Cairns blog: My Cashew Nut Tree. Most people enjoy eating cashew nuts, but if I were to ask how many know how they evolve before reaching the consumption stage, few would put their hands up – and I would have been one of them, until recently. This story started quite unintentionally and took four years to unfold. It is quite interesting that the cashew nut actually grows two fruits, the apple, and the nut underneath it; they can be yellow or red, depending on the variety. To my knowledge there is no other plant that produces two different fruits on the same stem. 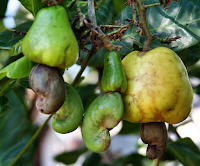 In some regions in the world they refer to the cashew nut tree, also as the “Cashew Apple Tree.” This picture shows the apples and nuts, and you see in the middle how the thickened stem above the nut develops into the apple. To enlarge pictures, just click on it! Many years ago I saw a cashew tree full with fruit on a friend’s farm. He grew it merely as a novelty and not for the nuts. The reason being, the tree is a sight to behold with its yellow apples, but the kidney shaped nutshells below the apple are toxic and it is a difficult process to extract the nut before it can be eaten. So this was all I knew about this subject. The cashew nuts we eat in Australia come in the main from India, or Africa and are processed there because extracting the nut is a labour intense process. PROCESSING OF CASHEW NUTS HOME. This story had its beginning four years ago, when I found several kidney shaped cashew nutshells spread over an area in the grass while moving my lawn. Because of that limited “cashew nut lecture” years ago on my friend’s farm I had no trouble recognising what I had found. I pondered though how the nuts had arrived on my lawn knowing that nobody in our close proximity has a cashew nut tree, and I surmised that the carriers would have been fruit bats which ate the apple and dropped the nut. I planted three of the nuts, each in a separate pot, and in due course three cashew plants emerged. Several months later I planted the most vigorous of the three seedlings in my yard, and got rid of the other two as I couldn’t find anybody wanting to plant a cashew nut tree. After four years the tree had grown to a height of 3.5 metres, but I thought that nothing would come out of it and that it may shade my veggie garden too much and I decided to cut the tree down. I had already removed some branches close to the ground in order to get better access to the trunk with the chainsaw. When I was about to cut down the tree, I noticed some branches were starting to produce flowers. So this gave the tree a temporary reprieve, as I was keen to find out if it would bear fruit – and it did. Now this tree will become a permanent fixture in my yard, even if it is only for the novelty value. However, the DPI in Cairns sent me instructions on how to process the nut and get it out from its toxic shell. But it was too complicated and not worth doing it. Picture on right: Cashew nut blossoms. From tiny blossoms big apples and nuts grow. It has been a wonderful opportunity to observe the development of this tree and its fruit on a daily basis – and my digital camera comes in handy to take pictures, which are immediately available. 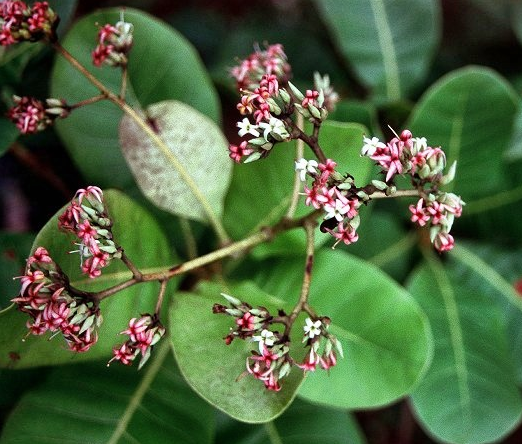 The blossom bearing part starts with a stem with numerous sprigs to which very tiny, but numerous flowers are attached. In addition, I observed a teeming multitude of tiny insects, visiting the flowers and no doubt assisting with the pollination. Interestingly the kidney shaped nut develops first, and right above the nut is a thickened green stem, which starts to develop the apple as soon as the nut has attained its full size. It takes approximately ninety days from the flowers to the time when the apple turns yellow and drops off; this is then the time to remove the nut. The apple is edible, has a pleasant aroma and is very juicy. It can be used to make jam or jelly. I’m told it is eaten by the natives in some countries. Once the apples are on the ground they start to ferment and deteriorate quickly, and become part of the food chain for ants. Although cashews are one of the lowest-fibre nuts, they are packed with vitamins, minerals and antioxidants. These include vitamins E, K, and B6, along with minerals like copper, phosphorus, zinc, magnesium, iron, and selenium, all of which are important for maintaining good bodily function. 1. Are cashew good for you? 2. Cashew nut nutrition facts. 4. Health benefits with video. 6. The nut that you can’t buy in the shell. How to post a comment. We all love to eat cashew nuts, but we never knew that there is more to this nut than meets the eye. Thank for sharing your experience with us - we will think of it when we eat them. Thank you, Werner, for this interesting posting. We never knew anything about this. Thank you for sharing your experience with us. Hi Werner thanks for your great blog on tis great nut tree, he first time I saw the cashew tree was in Phuket Thailand, they grow them there and also they make a liquid called cashewy which is a drink base this is very different in taste here is some info I found on the juice. It makes you feel refreshed, energetic and strong. It reduces inflammation and infections of your respiratory tract and strengthen your lungs. Regular drinking helps prevent common cold. reduce allergic symptoms and soothe your stuffy nose. It soothes your sore throat, reduces irritation and phlegm, relieves a cough and constriction of the windpipe and makes your voice clear. It helps balance the yon and yang of your body system. It helps reduce the symptoms of dysentery, gastric ulcer and chronic stomach disease. It relieves vomiting, helps increase the flow of urine, helps discharge of stones and sweat, improves the body's resistance to venereal diseases. It gives warmth to your body. It improves your eyesight and memory. I went to a cashew nut farm in Thailand and I think they boiled the nuts to remove the toxin from the nut and then it was labour intensive in 1995 one nut under a machine that cut the shell – the workers were missing fingers etc. This is all very interesting, Werner. your cashew nut tree. Something new for me to have learnt, very much appreciated. Why is there so much hostility in this world?